The shift of software infrastructure to the cloud has freed businesses from one of the major historical constraints of technology innovation. Modern APIs are fundamental to the cloud and are the key to flexible, real-time integration of systems and business processes. Because they were not built for API-driven integration, legacy email service providers (ESPs) struggle to meet the real-time requirements of data-driven, transactional email. Modern email delivery services like SparkPost are designed API-first and are native to the cloud. The cloud is deceptively radical. It has upended the economics of software development and enabled genuine business innovation. 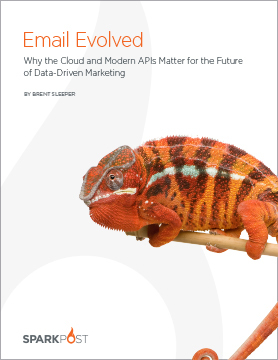 Download “Email Evolved” today to understand how the cloud and modern APIs have unchained email’s business impact and the future of data-driven marketing.